According to a well-known philosophical maxim, the last thing a fish notices is the water. Things that are unproblematic seem natural and tend to go unnoticed. Fish take the water they swim in for granted, just as European Americans take their race as a given, as normal. White Americans may face difficulties in life—problems having to do with money, religion, or family—but race is not one of them. White Americans can be sanguine about racial matters because their race has not been (until recently) visible to the society in which they live. They cannot see how this society produces advantages for them because these benefits seem so natural that they are taken for granted, experienced as wholly legitimate.They literally do not see how race permeates America's institutions—the very rules of the game—and its distribution of opportunities and wealth. Blacks, Latinos, and other people of color in the United States are racially visible, and everyone seems to notice their race. For them, the same culture, law, economy, institutions, and rules of the game are not so automatically comfortable and legitimate. In a white-dominated society, color brings problems. And if people of color cry foul, if they call attention to the way they are treated or to racial inequality, if they try to change the distribution of advantage, if they try to adjust the rules of the game, white Americans (whose race and racial advantage are invisible) see them as asking for special privileges. They are seen as troublemakers. What this means is that there is no such thing as a "view from nowhere"—to use Thomas Nagel's apt phrase. People's perspectives on race reflect their experience on one side of the color line or the other. Whites routinely misperceive the reality of black lives. For example, even though blacks are about twice as likely as whites to hold low-paying jobs and are more than twice as likely to be unemployed, 50 percent of whites say the average black is about as well off as the average white person. (Blacks, on the other hand, tend to be more realistic and accurate in their perceptions of their economic status relative to whites.) If white Americans make no effort to hear the viewpoints and see the experiences of others, their awareness of their own privileged racial status will disappear. They can convince themselves that life as they experience it on their side of the color line is simply the objective truth about race. But while this allows them to take their privileged status for granted, it also distorts their understanding. This error poses serious problems for conservatives' analysis of racial inequality. Of course, individual views within racial groups vary. Not everyone who shares the same subjective perspective will draw the same conclusions about policy. But any perspective that is unreflectively locked inside its own experience is limited, and this is particularly so when that perspective reflects the dominant culture. Failure to understand that they take whites' racial location for granted leads racial realists to ignore the ways in which race loads the dice in favor of European Americans while simultaneously restricting African Americans' access to the gaming table. White privilege, like the water that sustains fish, is invisible in their analysis. This chapter is about perspective, and how definition—the power to name—determines perception, and ultimately, prescription. It traces the difference it makes if one group's perspective pervades almost everything, from culture to law. Apostles of the new perspective on race insist that racism is primarily a thing of the past. They come to this conclusion because they filter their evidence and their judgment through an outdated, discredited understanding of racism as intentional, obvious, and individual. These misconceptions are not unique to any particular writer or writers. Many white Americans and American institutions, including the current Supreme Court majority, hold parallel views. Because racial conservatives ignore the variability of racial reality in America, they do not recognize that racism is lodged in the structure of society, that it permeates the workings of the economic, political, educational, and legal institutions of the United States. Without that recognition, however, we will be unable to resolve the pernicious problems of race that confront us as Americans. In the new conventional wisdom about race, white racism is regarded as a remnant from the past because most whites no longer express bigoted attitudes or racial hatred. The Thernstroms note that despite black riots and crime in the streets in 1968, "nowhere in the voluminous polling evidence available for these years is there any sign that whites were drifting in the direction of the virulent anti-black sentiments so prevalent in the 1940s and 1950s." Indeed, the real story for most whites is that racism has almost disappeared. Marianne Means flatly asserts, "We all agree that slavery was evil. But the blood of slavery does not stain modern mainstream America." The Thernstroms concur. "White racial attitudes have truly altered," they write. "Whites with a pathological hatred of African Americans can still be found, of course. But the haters have become a tiny remnant with no influence in any important sphere of American life." Racial realists conclude that racism has ended because of the massive change in white attitudes toward blacks over the past sixty years. For example, more than half of all whites once believed that blacks were intellectually inferior. In 1994, however, only 13 percent of whites believed that blacks had "less in-born ability to learn" than whites. Whites also used to favor school segregation by overwhelming majorities, but now 90 percent favor school integration. In the 1940s whites believed they should be favored in competition for jobs. Today, on the other hand, whites unanimously agree that "blacks and whites should have an equal chance to compete for jobs." The Thernstroms go so far as to assert that white attitudes had already changed for the better before the civil rights movement erupted in the 1960s. To racial realists, this evidence means that the color line has been radically altered. Although many whites still accept one or more negative stereotypes about African Americans, a recent study by Paul Sniderman and Thomas Piazza asserts that only 2 percent of the population could be considered old-fashioned bigots who subscribe to a large number of racist stereotypes. Consequently, it is rare today to find cases of discrimination such as the ones involving Texaco's executives calling African Americans "black jelly beans," a member of the Dallas school board referring to African Americans as "niggers," and the "raw racism" experienced by black secret service agents in a Baltimore Denny's restaurant. The evidence cited by racial realists indicates that they, like many whites, use a particular understanding of racism. This notion assumes that racism is motivated, crude, explicitly supremacist, and typically expressed as individual bias. Racism, in short, is a form of "prejudice." Paul Sniderman and Thomas Piazza define it as "a consistent readiness to respond negatively to a member of a group by virtue of his or her membership in the group, with the proof of prejudice being thus the repetitiveness with which a person endorses negative characterization after negative characterization." Given this concept of racism and the use of opinion surveys to measure it, one should hardly be surprised that many people believe racism is a thing of the past. After all, virulent antiblack sentiments have diminished, formal barriers based on malicious intent have in large part been dismantled, and few Americans would accept publicly sanctioned racial barriers today. Were these its undisputed characteristics, one might be tempted to agree that racism is obsolete. The law institutionalizes the American ideal of equality, and it provides remedies for those hurt by bias. Current law embraces the concept of racism as intentional individual prejudice, and also its corollary—that whites today are often unfairly accused. Evolving doctrine in racial discrimination cases reflects what Angela Harris has called an "essentially moralistic" view. In several reverse discrimination lawsuits, for example, the Supreme Court has explicitly worried that affirmative action plans impose unacceptable burdens on "innocent" third parties (read whites). In equal protection cases, the Court has increasingly emphasized invidious intention as a necessary element for finding actionable discrimination. But this perspective has its critics. Twenty-five years ago, Alan Freeman documented how, after a brief period of attention to what he called a "victim perspective" in the jurisprudence of equality, the Court moved decisively to adopt a "perpetrator perspective" on issues of race. Adopting the perpetrator perspective means looking at contested race issues from the vantage point of whites. The "perpetrator perspective" in law, like the conservatives' understanding of racism, is preoccupied with white guilt or innocence. It largely ignores whether people of color have suffered injury or loss of opportunity because of their race. Other critics have raised analogous arguments, paying attention to group subordination or disadvantage. Ignoring these analyses, the courts have extended and deepened their attachment to the perpetrator perspective as the racial law of the land. The Supreme Court's standard for white innocence is very low. Before the modern civil rights era, the Supreme Court often insisted that analysis of motive was inappropriate in constitutional adjudication. During the past several decades, however, the Court has increasingly required that plaintiffs in equal protection discrimination cases not only may, but must, probe defendants' motives. To be successful, plaintiffs must prove specific and conscious bad intentions, the equivalent of the concept of racism as personal prejudice. Under the equal protection clause of the Fourteenth Amendment, the Court holds it is not enough to show that people would reasonably know the discriminatory consequences of their actions. Nor is it enough that actors foresaw the predictable effects of their actions and still proceeded in spite of them. To gain or sustain a remedy for racial injustice, litigants must meet a very high standard: they must show specific discriminatory purpose or malice. Reva Siegel argues on the basis of credible evidence that the Court knew this was a level of responsibility plaintiffs would "rarely be able to prove." Under congressional statutes, the role of intent is somewhat reduced. The Court has sometimes said that proof of employment discrimination may be based on a demonstration that policies have a disparate impact rather than on a showing of intent—proving, for example, that African Americans or other racial groups are more likely to be disadvantaged by an employment practice than whites. Although the courts give lip service to unintentional bias in cases involving claims of discriminatory treatment, particularly in employment, most of the governing precedents require that plaintiffs prove intentional bias. In 2001 the Supreme Court further extended that requirement. It held that under Title VI of the Civil Rights Act, which prohibits the discriminatory use of federal money, proving disparate impact would no longer be sufficient to win discrimination suits by private parties against federally funded contractors or institutions. The Court now requires proof of invidious intention in most cases of racial discrimination. It does not apply this standard of intent in age discrimination cases where the relevant statutory language is identical to that in Title VII. In these cases, the courts have accepted a distinction between motive (a factor in causing action) and intent (a specifically proven state of mind) that is more favorable to plaintiffs alleging discrimination. In other settings that address harms caused by others, such as personal injury law, courts assess liability and compensate victims not simply for intentional harms but also for injuries caused accidentally, that is, negligently. Plaintiffs do not have to prove malice or purpose unless they seek punitive damages. Choosing to make the specific intentions of identifiable individuals the criterion of racism is neither neutral nor appropriate. It is self-aggrandizing and misguided to judge others by their actions but ourselves only by our intentions. In Supreme Court decisions and in the minds of many whites, the relevant "ourselves" are predominantly white or, in Freeman's phrase, potential "perpetrators." Many whites want to determine whether racism exists by exploring their explicit personal intentions. If we are deciding whether to put someone in jail, then assessing his intentions may be appropriate. However, where disputes do not involve criminal charges but rather decisions about social, educational, welfare, or employment policy, questions of guilt, innocence and punishment are not the issue. No one goes to jail for discrimination. In discrimination litigation, the focus is on the legitimacy and fairness of the distribution of scarce opportunities and resources. To ameliorate injustice and achieve a more desirable state of civil affairs, it is more important to examine the problems of discrimination, injuries, and unfairness than to evaluate the culpability and motives of particular perpetrators. The Court's narrow definition of discrimination, like the realists' equation of racism with prejudice, severely restricts what counts as bias or as evidence of bias. This definition tends to exonerate whites, blame blacks (by default), and naturalize (render unobjectionable) the broad realities of race-based subordination in the United States. This definition of racism, as we have already noted, is also empirically and conceptually flawed. It depends almost exclusively on attitudinal evidence uncovered by opinion polling. This poses two problems. First, even on its own terms, this interpretation of racism ignores significant research that shows how racist attitudes have persisted. In his recent book The Ordeal of Integration, Orlando Patterson examined a variety of evidence and concluded that "all things considered, it is reasonable to estimate that about a quarter of the Euro-American population harbors at least mildly racist feelings toward Afro-Americans and that one in five is a hard-core racist." This is not a small number. If Patterson is correct, the Thernstroms' "miscreants of the night" are hardly a fringe. Second, by relying on survey questions written in the 1950s, this research ignores possible changes in the character of racism and is, therefore, incorrectly measuring modern expressions of it. Donald Kinder and Lynn Sanders write that "a new form of prejudice has come to prominence, one that is preoccupied with matters of moral character, informed by the virtues associated with the traditions of individualism. Today, we say, prejudice is expressed in the language of American individualism." Statements about individual failure, in other words, may be racially coded expressions of a derogatory stereotype. There are also abundant survey data documenting the persistence of widespread racial prejudice forty years after the civil rights revolution. Many writers who use polling data to show the decline of racism cherry pick among these surveys and omit this evidence. Some of the most compelling evidence of tenacious prejudice comes from studies of residential discrimination. In 1992, the Detroit Area Survey found that 16 percent of whites said they would feel uncomfortable in a neighborhood where 8 percent of the residents were black, and nearly the same percentage said they were unwilling to move to such an area. If the black percentage rose to 20 percent, 40 percent of all whites indicated they would not move there, 30 percent said they would be uncomfortable, and 15 percent would try to leave the area. Were a neighborhood to be 53 percent black, 71 percent of whites would not wish to move there, 53 percent would try to leave, and 65 percent would be uncomfortable. A more recent study of four cities (Atlanta, Boston, Detroit, and Los Angeles) yielded similar results. Camille Zubrinsky Charles found that more than half of whites in these four cities expressed a preference for same-race neighborhoods, while blacks expressed a strong preference for integrated neighborhoods. Contrary to the optimism of racial realists, one finds precious little evidence, even in the polling data they use, that many white Americans believe in integrated neighborhoods, especially if that means a neighborhood with more than a very few black families. Pejorative racial stereotypes are not restricted to one's choice of residence. They continue to be fundamental to (white) American culture. When the University of Chicago's National Opinion Research Center asked people to compare blacks and other ethnic groups on a number of personal traits in 1990, they discovered that 62 percent of nonblack respondents believed that blacks were lazier than other groups, 56 percent stated that they were more prone to violence, and 53 percent thought they were less intelligent. Another report suggests that white Americans are still substantially opposed to intimate contact with African Americans. In one national survey conducted in 1978, 70 percent of whites rejected interracial marriage on principle. This hardly represents the significant change in whites' attitudes trumpeted by the proponents of racial realism. Both the meaning of survey data and the way they are used by these cheerleaders for racial progress are also problematic. Because the typical questions used to measure changes in racial attitudes essentially gauge how closely attitudes conform to the American creed enshrined in the Declaration of Independence, it is not surprising to find that most (white) Americans sound tolerant. This is because when prejudice and tolerance are evaluated by these criteria, the questions assess only whether people subscribe to American ideals. It is hardly a major discovery to find that racism has declined when individuals are asked whether they believe in equal job treatment and integrated schools. Because the ideals of equality and formal tolerance are central to American identity, most Americans know the "correct" answers to such questions. Thus, rather than representing a decline in racism, these polling data actually measure adherence to the principles of American society. Because most surveys tap only surface commitment or verbal adherence to ideals, polling data may reveal more about the correlation between self-presentation and socioeconomic class than about the persistence of racism. When tolerance means verbalizing principles acquired through exposure to liberal middle-class institutions, lower- and working-class whites will appear to be more racist than middle-class whites. Surveys that find prejudice and intolerance declining among America's white middle class also link racist sentiments disproportionately to poor and working-class white Americans, or to the "lunatic fringe." This finding is not new. As long ago as 1966, Paul Sheatsley found that the highest scorers on his "pro-integration scale" shared three features in common: they attended college, their earnings were high, and they were professionals. But the narrow catch of this racism net reflects only its limited definition of racism. White Americans, abetted by neo-conservative writers of all hues, generally believe that racial discrimination is a thing of the past and that any racial inequalities that undeniably persist—in wages, family income, access to housing or health care—can be attributed to African Americans' cultural and individual failures. If the experience of most black Americans says otherwise, an explanation has been sorely lacking—or obscured by the passions the issue provokes. 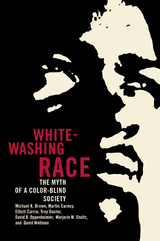 At long last offering a cool, clear, and informed perspective on the subject, this book brings together a team of highly respected sociologists, political scientists, economists, criminologists, and legal scholars to scrutinize the logic and evidence behind the widely held belief in a color-blind society—and to provide an alternative explanation for continued racial inequality in the United States. While not denying the economic advances of black Americans since the 1960s, Whitewashing Race draws on new and compelling research to demonstrate the persistence of racism and the effects of organized racial advantage across many institutions in American society—including the labor market, the welfare state, the criminal justice system, and schools and universities. Looking beyond the stalled debate over current antidiscrimination policies, the authors also put forth a fresh vision for achieving genuine racial equality of opportunity in a post-affirmative action world. 2. The Bankruptcy of Virtuous Markets: Racial Inequality, Poverty, and "Individual Failure"